A rollover accident in Oakland early Tuesday landed a woman, her son and her son-in-law in the hospital, police said. The woman in her 40s was driving near 44th Avenue and San Leandro Boulevard around 1:10 a.m. when she rammed into parked cars, before the vehicle flipped over, police said. 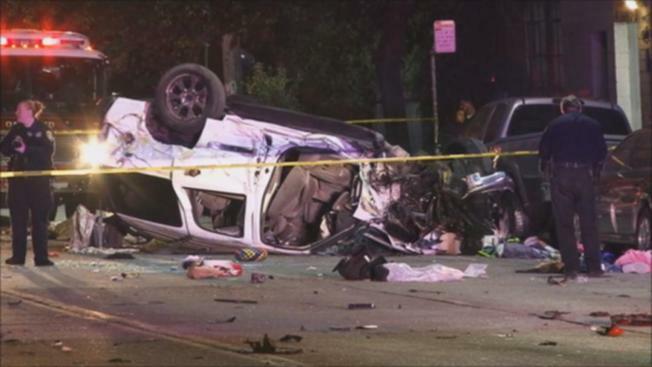 Police believe the woman had been drinking before she lost control of the vehicle, while driving at a high rate of speed. The car, which was heading north, rolled over in the southbound direction and smashed into poles and cars, police said. The woman and her son, who was sitting in the front seat, were taken to an area hospital with minor or moderate injuries. Her son-in-law, who was sitting in the back seat, was hospitalized in critical condition, according to police. Police said that they are also looking into whether or not the woman and passengers were wearing seatbelts. San Leandro Boulevard was closed between High Street and 45th Street for some time while police investigated the grisly crash and the accident is still being investigated by Oakland police. People with information about the crash can call (510) 777-8570.